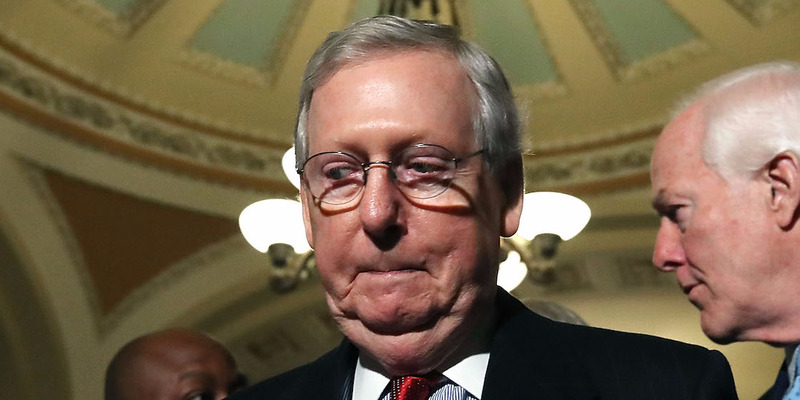 Mark Wilson/Getty ImagesSenate Majority Leader Mitch McConnell. Senate Republicans are attempting to pass their tax bill using budget reconciliation, which allows it to pass with a simple-majority vote. A bill passed under reconciliation must also abide by the Byrd rule, which says the bill can’t add to the debt outside of a 10-year window. According the the Penn-Wharton Budget Model, the current Senate GOP tax bill fails that key test. The Senate GOP’s legislation overhauling the federal tax code would not pass the chamber due to a critical budget rule, according to a new analysis. The University of Pennsylvania’s Wharton School model found that the current Senate iteration of the Tax Cuts and Jobs Act would decrease federal revenues and add to the national debt outside of a 10-year window. That would mean the TCJA would not qualify under budget reconciliation, the process Republicans are using to pass the bill. Reconciliation allows the GOP to pass the TCJA on a party-line, simple majority vote without being subject to a Democratic filibuster. Republicans only control 52 seats in the Senate. But the bill is subject to a slew of different rules under reconciliation. That includes the Byrd rule, which has two key provisions: The bill can only add a specified amount of debt in a 10-year window (in the TCJA’s case, $US1.5 trillion), and it can’t add any debt outside of that window. On the first, Senate Republicans were able to fit the bill under the $US1.5 trillion threshold by ending, or sunsetting. certain tax cuts after the 10-year window. For instance, all of the individual tax cuts proposed in the bill would end after 2025. But the TCJA’s large proposed permanent cuts for things like corporate taxes would make it add to the deficit outside of the 10-year window. The TCJA would increase the deficit in six straight years outside of that window, the analysis said. That could require Republicans to come up with substantial changes to the bill to get it through the Senate – or find a way to get all of their conference, plus eight Democrats, on board. The Penn model is not the official congressional arbiter of whether the bill complies with the Byrd rule. That falls to the Joint Committee on Taxation, which has not yet released a detailed analysis relating to the Senate bill’s compliance with the rule.